If you need an oxygen bar at your event in Telluride, Ouray or anywhere in the San Juans, you’ve come to the right place. Oxygen Delivers is a full service oxygen company in Telluride, and our Oxygen Bar Event service is quickly becoming a hit at weddings, reunions, corporate events, and more. You’ll be happy to know that your event will feature a unique high end customized oxygen bar that brings in the atmosphere of a spa. The look and feel isn’t like the plastic bubble. run of the mill oxygen bars you may be familiar with. Our oxygen bar has the look and feel of a REAL Classy Bar, and will draw the people in your event to it; It brings a feeling of warmth to the event. Our service includes our oxygen mixologist to host the bar. She’ll be helping your guests get hooked up to their oxygen, which includes a humidity solution consisting of distilled water and organic, high altitude, essential oil blends. Will your guests enjoy an Oxygen Bar? 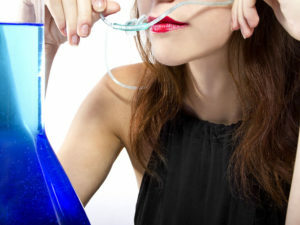 If you’ve never been to an event with an oxygen bar, you may be wondering if it’s something people will really enjoy or even use. Interestingly enough, in our experience hosting oxygen bars in Colorado, we’ve seen more people in line for the oxygen bar than the drink bar at times. The biggest problem might be getting your guests to give up a spot at the bar so others can get a turn. There are several benefits of having an oxygen bar at your event. One of the straight forward benefits is it will help anyone with issues adjusting to the altitude to have a much better time. Sometimes people that come to the area have to leave events early, or even leave town because they can’t quite adjust to the altitude. The improvement a person can get from the supplemental oxygen can be the little boost they need to stay for the whole event and have a great time too. Mentally, the oxygen can help people feel awake and clear headed. This can contribute to the liveliness of your event. When should you book our oxygen bar services for your event? The sooner you book our oxygen bar service, the better. If you’re needing something last minute, 4 days before your event is as last minute as it should be. Ideally you should book a minimum of a week or 2 in advance, and earlier is even better. At Oxygen Delivers we want to help create an extraordinary atmosphere at your event with our oxygen bar service, that’ll create great memories for you and everyone that attends your event. What’s The Cost Of Having An Oxygen Bar At Your Event? You’ll be happy to know our oxygen bar packages & prices are competitive, even though we give more than our competitors. We have a simple price formula based on the number of guests at your event and the duration of the event. Oxygen is our business and we think you’ll love our Oxygen Bar Service! Looking For Oxygen Concentrators? CLICK Below!